Fossil evidence proves that there were no squirrels in South America before the formation of Panama, the natural bridge that allowed migration in both directions, of a wide variety of species, known as the Great American Interchange. 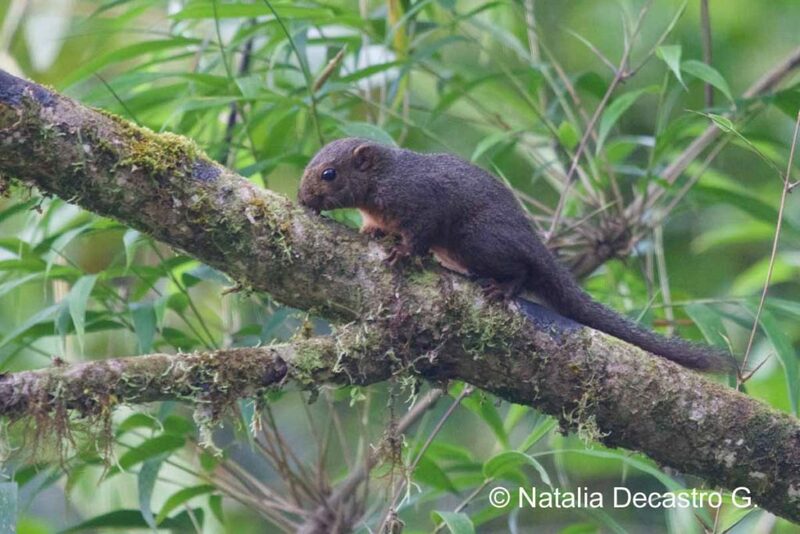 Dwarf squirrels (Microsciurus), are found in evergreen tropical rainforest regions of Central and South America. Their small size, dull coloring, shy behavior and speed make them difficult to find. These are some of the reasons why not much is known about these little mammals. The home of the Pygmy Squirrel, evergreen tropical rainforest, Palo Seco Protected Forest, Bocas del Toro. In Western Panama, two species of this group can be found, the Alfaro´s Pygmy Squirrel (Microsciurus alfari) and the Western Dwarf Squirrel (Microsciurus mimulus). Both of the species look very much a like. The best way to differentiate them, is by the white ear spots on the Alfaro´s Pygmy Squirrel. However, the ear spots are absent on the animals found in Costa Rica and Western Panama, which makes it difficult to tell them apart in this part of the world, as their distribution overlaps and both species have similar behaviors. Pygmy Squirrel (Microsciurus spp.) photograph in the Palo Seco Protected Forest, Bocas del Toro. None of the members of this genus are endangered, but it is hard to know the real numbers of their populations because of the lack of information and studies related to those cute creatures.